Exporter of a wide range of products which include automatic soap wrapping machine and detergent cake wrapping machine. UNIQUE PACKAGING SYSTEMS a leading manufacturer and exporter of a diversified range of Soap Wrapping Machines. These soaps packing machines are suitable for various shapes and sizes of soaps. Our machines pass through various rigid quality tests which ensures high efficiency of the machine. These soap wrapping machines are fabricated using premium quality raw material and sophisticated technology in compliance with international standards. 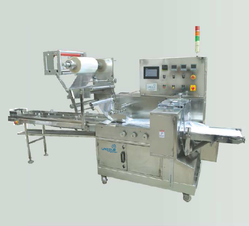 UNIQUE PACKAGING SYSTEMS offer Horizontal Wrapping Machines for packing of Detergent Cake, Muffins, Ice bar/Ice cream Sticks,Biscuits, Gajak, Chikki, Chocolates, Soaps, Toys, Ball Bearing. Highly Suitable for packing of Biscuits, Chocolates, Soaps, Stationary items, Syringes, Ball Bearings, Toys and other Solid Products.